Phil Mickey, a 12-year veteran of the CIS program, recently began meeting with Marcos at Southwest Elementary School. Over the last 12 years, Phil Mickey has spent countless hours in the company of young people whose life situations are worlds away from his own. The experience of being a mentor with Communities In Schools of Lexington/Davidson County, he insists, is rewarding on many levels. “I have been so blessed in my life and I want to share that blessing. Also, those that I have mentored and worked with through CIS have been a blessing to me,” said Mickey, a retired PPG Industries engineer. He currently works part-time at Pastor’s Pantry. Mickey chose to become a mentor after learning about CIS at his church, First Baptist on West Third Avenue. “Part of it is that I only have daughters and I thought it would be neat to mentor a boy. Also, I just wanted to follow through on my faith and help someone who might have a need,” he said. Looking back on the relationships he has shared with three different students, Mickey admits it’s not always as easy as stepping into someone’s life and sparking an instant transformation. “Through the years there are some disappointments as children get older. It is discouraging that despite your best efforts, you cannot always influence the results of a child’s behavior. Other influences are sometimes hard to overcome,” he said. Finding joy in the simple, fun moments together is key. 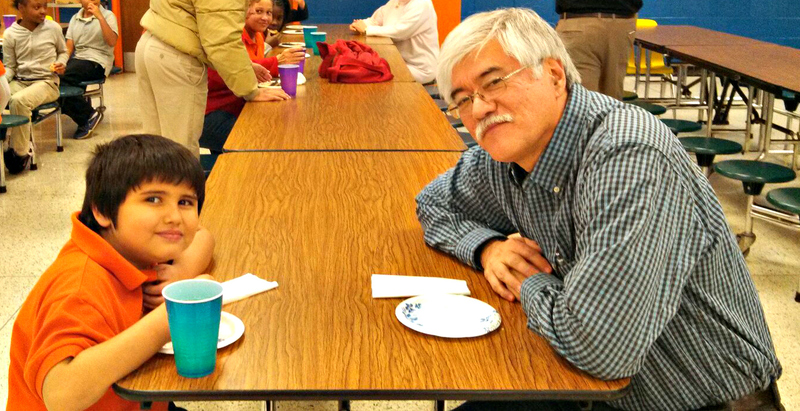 “I have enjoyed going to a basketball game, seeing the Christmas lights at Tanglewood (Park in Winston-Salem), ringing the Salvation Army bell, and just having lunch and talking,” Mickey said, adding that he is looking forward to a fun future with his newest mentee, Marcos, a second grade student at Southwest Elementary School. The new friends initially bonded over a sticker book in the office of Southwest Elementary ’s CIS site coordinator, Stacie Thompson. Mickey said the activity helped him break down barriers and start the process of gaining Marcos’ trust and confidence.